Home > What is Certification? What is a Mellow Colour ISO 12647 Proficient Printer? 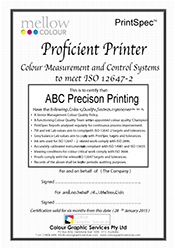 All the printing Companies in the Proficient Printer Directory have received training in the practical implementation of ISO 12647 and operation of the Mellow Colour Print Quality Management System. They all have an appointed 'Colour Champion' and a colour QA team focused on creating a culture of continuous improvement through the measurement and analysis of colour. They use printing equipment and consumables combinations that have been optimised to meet the targets and tolerances of the ISO 12647 Specification - plus the demanding grey balance appearance targets of the Mellow Colour Quality System. They all use D50 lighting in colour critical areas for viewing prints and proofs. Their colour measurement instruments are regularly calibrated and certified by the manufacturer, and they are visited every six months by a Mellow Colour specialist for revision training and review. In other words these printers put a lot of resources into producing consistent standardised colour appearance conforming to the ISO 12647 Specification. A minimum Audit score of 70% for the Mellow Colour QMS is required for entry onto the Proficient Printer Register. *Some Proficient Printers make their audit documents available to clients on request. Tight control of Brand colours is essential for this level of certification, and instrumentation has to be more precise for the demanding type of work that ImpressionProof Certified Printers undertake. A nominated ImpressionProof Champion responsible for internet submissions of print run reports has to be appointed. 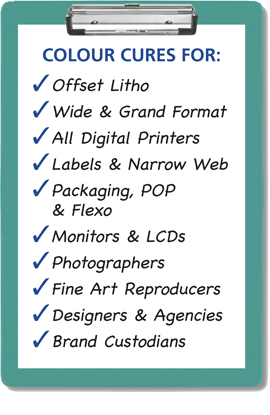 Certified printers are authorised to upload conformance repots to clients for acceptance. ImpressionProof Certified printers agree to spot checks being made on a random basis to make sure that previously uploaded conformance reports and prints match. *Some ImpressionProof Printers make their QMS audit and spot check documents available to clients on request. 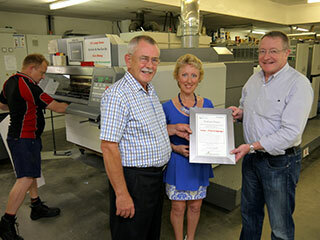 Mellow Colour 100 Club Membership is awarded to ISO 12647 Proficient Printers that can provide PrintSpec Reports made from recent production print runs that show a score of 100. This means that the Company is capable of producing work 100% in compliance with the tight targets and tolerances of the Mellow Colour Quality management system. The scoring system is heavily biased towards grey balance and consistent scoring of 80 is considered excellent by major print procurement companies and brand managers.The 100 Club award is valid for 12 months following submission to Mellow Colour of a dated production print sample scoring 100%. *Copies of the current 100% scoring reports are made available to clients by some 100 Club members on request. For more information about the Proficient Printer Program and Mellow Colour print quality management systems please contact us.